Last Friday i went to my friend Shayna's house so i could go with her to her ward's christmas party. that day it was decided by someone (who knows who came up with it) that thursday was going to be "Ugly Christmas Sweater Day" probably inspired by the new drake and josh christmas movie where they have an ugly christmas sweater party. well, i just had to be in on this dress up day, so me and shayna went around to different thrift stores in search of the ugliest christmas sweaters we could find. now, believe me, we have a TON of thrift stores here. no d.i., but a lot of hospice ones and a big salvation army. our first stop was the salvation army, and they have some of the ugliest clothes i've ever seen, but you know i was grateful that i didn't have to shop there regularly. they did, also have some kinda cute things, or at least things that could be cute in a kind of funky way. well everything there was kind of gross, and we didn't find any real christmas sweaters, so we went to the next stop. this was a little hospice thrift store, and we weren't expecting to find much. but as soon as the door opened, we layed our eyes on the most wretched sweaters i've ever seen. they were perfect. so of course we grabbed them, 2 for $4, what a deal. 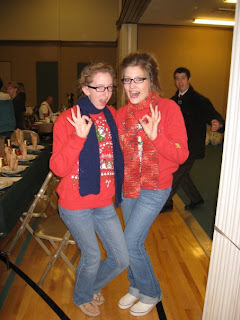 so we decided to wear them to the christmas party. on friday nights, our little city of grass valley, which is the cutest little mining town ever, has whats called "cornish christmas". they block the main streets off and people dress up, they have a nativity seen and people have little booths to sell things. its so much fun. well before we went to the christmas party, we decided we needed to make our outfits even uglier, so we went to the dollar store and tried to find ugly glasses, but they only had kinda cute ones. well we got a pair and popped the lenses out bc neither of us need glasses then we were off to the partay. the grass valley ward (which is the ward shayna is in) has a lot of older people, and they didn't get our little outfits, and all thought the sweaters were so cute. 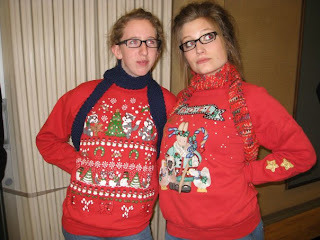 and then we saw a lady that had a sweater just like ours and the SAME glasses. she probably didn't think we were very funny. well anyways, today was the official day and me and shayna wore our sweaters. only like 5 other people wore them, but thats okay bc ours were the best.